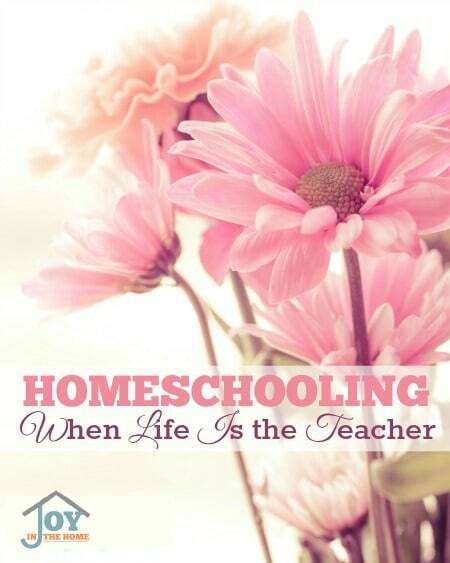 Do you ever have times in your homeschooling journey where life gets so crazy that you can't seem to get the lessons done or even get the books out. I have had a few seasons like this and when I look back I realized that although the books weren't out, we were homeschooling and life was the teacher. We all have seasons where sickness hits our home, a new baby is born, an extended family member is dealing with illness or even a death of a loved one takes us from the normal routine of life. How can you still homeschool through these seasons? You allow life to be the teacher. Life is full of lessons that we all need to learn and would benefit our children to learn them in real life and out of books. If you know how much I love books, you will understand that I don't make that statement light-heartedly, and I'm not saying that life should be the only teacher in a child's life. I'm no saying that at all! Often times it is through these seasons in our homeschooling that our children can learn some of the most overlooked characteristics in today's culture and they can truly begin to nurture them in their own lives, forming them into loving, caring people. Our children learn to pick up the slack that occurs when I'm needing to tend to the sick ones, or even take a day in bed for myself to regain health. Tending to the meal, or younger siblings are the first things that will be expected from my older children. Our younger children learn how to respect others by being quiet when sick ones need more rest to recover. We take advantage of learning resources on DVDs, audios and such to continue our learning while resting and allow for our home to stay quieter. What I love most about the lessons taught when sickness hits our home is seeing the genuine love for each other through serving the needs of those that are sick and taking care of what they normally do. During our homeschooling journey, we welcomed two babies in our family and both times, we had some issues that came with them. I needed to have an emergency gall-bladder surgery when our third child was only three weeks old. My head was spinning with concerns of how my husband was going to deal with taking care of our newborn and our older two children, then 8 and 6, while I spent two days in the hospital plus weeks of recovery. Only breastfeeding our son, and the quickness for the surgery (my gall-bladder was infected badly and full of stones), I had no time to prepare him for taking a bottle or pumping my milk for him. In addition, the medication that I was taken was not safe for breastfeed babies. I remember my husband calling me from home, overwhelmed at the baby crying no stop and not sure what to do next. I suggested giving him more formula, since you can never tell how much a nursing baby gets in a feeding. We hung up and I bald like a baby because I couldn't be there for him. Shortly after, my husband called me back and told me that had to be it because he finished another bottle and was already asleep. My husband didn't sleep well that night and by morning, our 8 year old daughter happily stepped into the mother role and took care of the baby, almost as good as I would have. When our last son was born, he had a health issue that caused him to be extremely gassy and unable to get into a full sleep due to his trachea collapsing and not being able to breath without being moved. Needless to say, I didn't sleep for 4 months. However, when our daughter, who was then 16, would wake up, I would literally hand the baby over and go for a 2 hour nap before needing to nurse again. This baby refused to take a bottle and that required me to be on call non-stop. Exhaustion is putting it lightly. Homeschooling and homemaking were not on my list of importance during these survival months. My children learned independent learning in homeschool more than I would have expected, they took charge of the home and meals, while giving me the support I needed. These lessons could never come from a book. On a few occasions, I have had to pack up my children and drive 400 miles to help my parents when they were really sick and help nurse them back to health. The freedom of homeschooling afforded me this opportunity to help my parents when others may not have been able to do so. During these times, my children would work on some school work, but what lessons life provides to taking care of the needs of others is priceless and worth teaching. Scriptures can be copied onto get well cards. Stories read aloud for the enjoyment of the sick loved one. Narrations can be listened to, as well. Serving others with joy is a lesson that I know my children have learned well and only because we allow life to be the teacher. Our family has been spared the hurt of losing a really close loved one, but when it does happen, I can see that life will need to be different for the time to grief and allow healing to take place. I could see our home using music, scripture and poetry to help the grieving process. Taking time to go through photos and other memories to be able to celebrate the life of our loved one that waits on the other side of eternity. Lessons of salvation, right choices and repentance would most likely be common in our days for our younger ones to grasp the sadness that our family would feel. Whatever the season you find yourself in, take joy in knowing that homeschooling when life is the teacher has the opportunity to teach your children lasting lessons that could forever impact and mold their character in whys that curriculum could never being to teach.